So much depnds on how you look at it; on whether the sweet and beautiful children we adore are bickering with one another or are creating the most breathtaking drawings, forts, and stories, on whether or not we have a few extra bucks to buy some yarn with or other such fun purchase or we are staring at the checkbook wondering how to cover all those bills. I am always in awe of this phenomenon. One day this house can seem like it will never see order again and the farm will appear covered in weeds when the next, perhaps with the fresh eyes of a new day to view it all with, it will rival Eden in all its glory. It all depends on the lens we are using. As we gear up for one of our annual CSA open farms, we can’t help but think of “all” that needs to be done before the party. This is the kind of event that immedietly brings out the worst sort of glasses for us to wear, not a hint of rose shading to help ease the glare that comes from certain areas of the farm (not to mention the house which is in mid-bedroom-switcheroo anyways). All that seemed possible to keep up with in spring has reached its hey day, meaning that in those areas I didn’t make it to, the weeds I so desperately wanted to knock back have once again gone to seed. With just a few days in the midst of what is still a pretty busy time on the farm, I know that things are going to look mostly the same on Sunday as they do today. We used to go crazy trying to whip this place into shape for such events–and we still do make this an opportunity to take care of certain things that we have been meaning to get to, things on the farm that get pushed to the side in favor of planting and weeding and harvesting the food crops–but I have also come to realize that it matters so much less than I used to worry it did. The fun of these events is the getting together, the beautiful countryside, the spectacular view and warm summer evenings. Sharing the growing space with the folks who eat from it. So, like the bees and other wild critters who thoroughly enjoy not only the wild areas we intentionally create as homes for them and as buffers from our neighbors’ conventionally managed farm fields , but also the wild areas we meant to tend to that are now covered in thistles gone to seed, I will try to enjoy it all too. 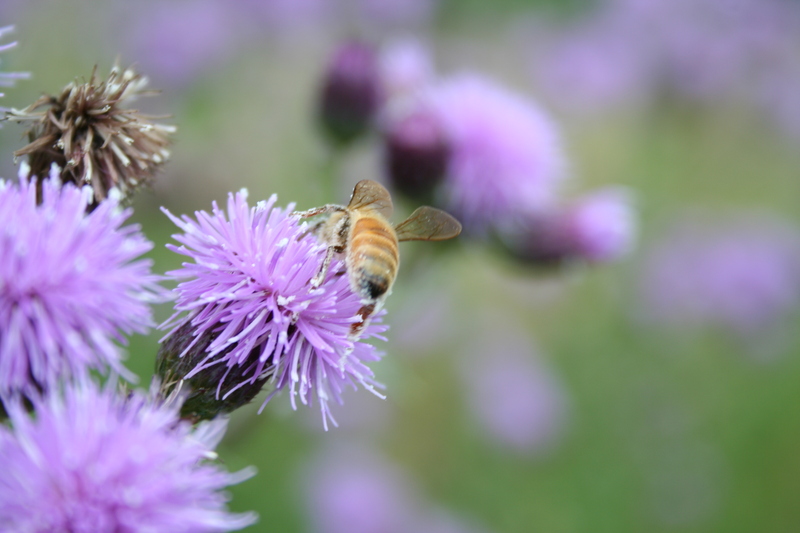 The farmer doesn’t even want me to mess with those thistles anyways, he loves how many bees feed from their pretty purple flowers. My take on it is a little different. I figure since we provide a lot of bee forage from other plants on this farm, this one–so prickly and poking when it finds its way into the vegetable beds–I am going to try to get rid of, at least on this side of the property. But since that didn’t happen this year, I am trying to look at it as I have in other years. Positively. Through the right lens, everything is as it should be. The tale of this farm, this year, when you come to visit, is the tale of another year of living here, many things coming more and more to look like our vision of the farm, as well as many, many things that fell by the wayside. It was a year with a new baby in tow, with three busy big kids to tend to, and lots of farming to be done. All in all, what you see means good things happened. It means time for the kids, for play, for summmer! It means lots of food grown for our community. And it has made a lot of bees very, very happy too. Through their eyes, this place is a thing of beauty. And when I look at it with my heart, that is what I see too.